We reviewed Kjaerhus Audio's Classic Series freeware plug-ins in SOS March 2004, and they have now launched a shareware Gold Series. These feature beautifully rendered 'brushed gold' front panels, 64-bit internal processing for a more 'analogue' sound with greater detail, and support for sample rates up to 192kHz. Golden Equaliser is a versatile five-band parametric design. Each band has a set of colour-coded rotary Gain, Frequency and Q controls, while the top and bottom bands can be switched to a shelving response. There are also separate low-cut and high-cut filters offering slopes of up to 48dB/octave, which can be handy for removing subsonic rubbish at the low end, for instance. The stereo channels can be adjusted together, separately, or in a linked fashion relative to their current settings, while mono and permanently linked stereo versions are also supplied, and have correspondingly less CPU overhead. Even on the full version this is modest, taking just 2 percent of my Pentium 4C 2.8GHz with all five bands active. There's a graphic display above the controls that shows each channel's frequency response in a different colour. You can zoom into any area by drawing a box around it with your mouse or scroll it by mouse-dragging, or you can switch to Auto Scale to have the gain range adjust itself automatically so the current response fills the display in the vertical direction. I found this really useful when trying out subtle mastering curves that might only be ±1dB at most, and therefore almost invisible on most other EQ displays. So far, Golden Equaliser provides an elegant yet comprehensive array of controls, but there's a clever twist to come: the band-pass filter sections can be globally set to one of four different EQ 'styles'. Type 1 has symmetrical boost and cut curves and tightens the bandwidth at lower gain settings for precise adjustments, whereas Type 2 has identical boost curves to Type 1, but has significantly higher Q when cutting, just like the Pultec and Waves Renaissance EQ. This is more suitable for notching out hums and other surgical procedures, and generally sounds more 'musical'. Type 3 and 4 are once again symmetrical in their cut/boost curves, but Type 3 maintains constant Q at any gain setting, while Type 4 widens the bandwidth at low gain settings, making it more suitable for mastering or mixdown duties. Careful listening tests confirmed that at maximum boost all four sound identical, so the same filter algorithms are used for each Type, but this flexibility in response curves does affect the way you apply EQ, and is a useful addition. 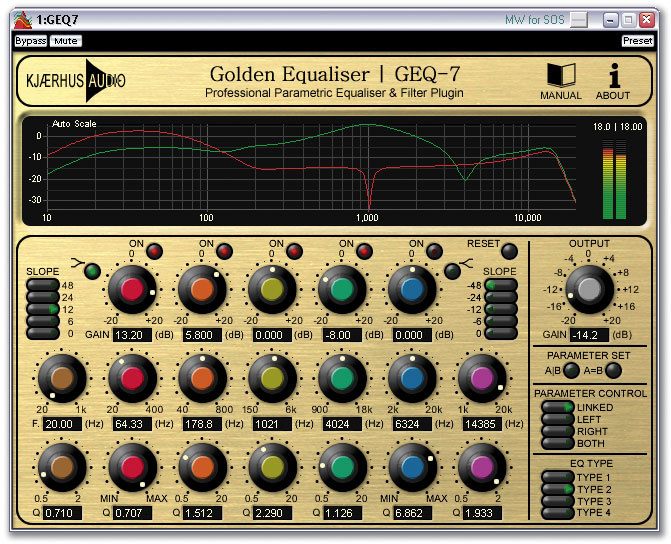 Golden Equaliser certainly looks good and is easy to use, although I missed the ability to type values directly into the text readouts for each control, and it's sometimes difficult to dial in the exact value you're after with the rotary control. After auditioning it on a wide range of material in comparison with various other EQ plug-ins in my collection, to my ears it sounded far sweeter than any of the ones bundled with PC sequencer applications. I felt that both PSP's Master Q and Waves' REQ pipped it to the post, although this is still a compliment, as these are both significantly more expensive. Overall, it's a good-sounding and surprisingly versatile EQ that should appeal to anyone who wants to upgrade the bundled plug-ins that came with their sequencer. 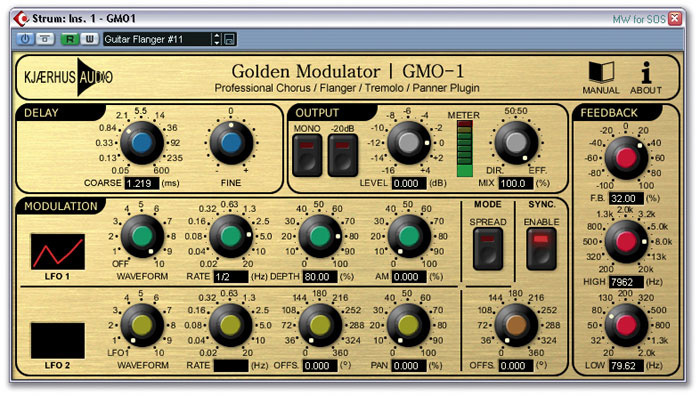 Golden Modulator is based on the Chorus and Flanger from the Classic Series, but offers a lot more effects and options in one neat plug-in, and uses 4x oversampling for higher-quality results. At its heart is a stereo delay, variable between 0.05 and 600 ms. Low delay times are used to get comb-filtering and flanging effects up to about 20ms, with higher values generating discrete echoes. You can apply Feedback either in or out of phase to prolong the repeats, and roll off low or high frequencies so that the repeats gradually get duller or brighter. It's the Modulation section that brings the unit to life. There are two LFOs, the first being connected to delay time and amplitude modulation of output level (tremolo), while the second provides a panning effect for the stereo delayed signal. When the Spread Mode button is active, the right delay time is modulated by LFO2 instead of LFO1, to enable stereo effects. The LFOs themselves are quite versatile, with a choice of 10 waveforms, and rates variable from an incredibly slow 50 seconds per cycle up to 20Hz, while there are separate Depth controls for the Delay, AM and Pan effects. LFO2 can also have its waveform and rate locked to LFO 1, but offers an Offset control that lets you stagger the waveforms for stereo effects. When Host Synchronisation is enabled the LFO frequency jumps to the nearest frequency that fits the tempo of the song, from 128/1 to 1/8. Sync Offset lets you offset both LFO waveforms relative to the sync signal from the host application. 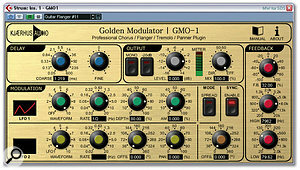 Golden Modulator $72.50; Golden Equaliser $122.50; Gold Bundle $156. Prices include 25 percent VAT, payable by EU customers only. 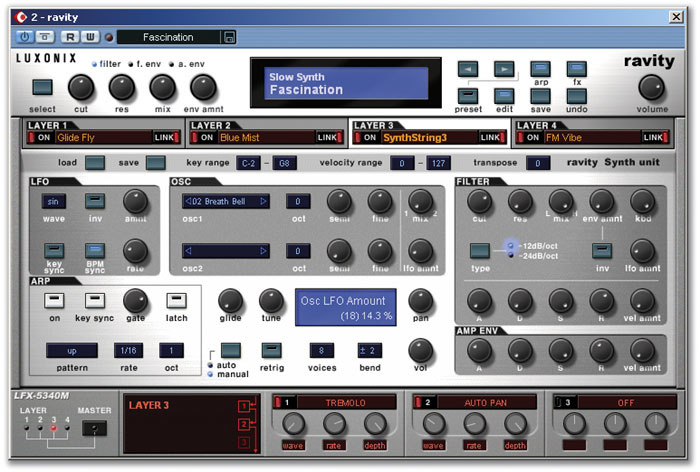 Luxonix's first VSTi release is Ravity, a PCM-based synthesizer module supplied with a 32MB wave database. Given some of the very sophisticated virtual synthesizer instruments now available, that might not sound too exceptional. However, Luxonix have provided a very compact and easy-to-use module that is capable of producing a good palette of bread-and-butter sounds (drums, pianos, organs, strings, brass, basses and synth leads, basses and pads) suitable for almost any style of music. Thanks to a neat sound-layering system (a patch can contain up to four layers, each of which can be edited independently), it is also capable of some sonic surprises. Ravity actually consists of two modules. A rhythm unit, Ravity R, is supplied with a wide range of very useable drum kits. The sounds cover dance, hip-hop, electronica and rock and are assembled into various sets. While each sound is based upon a single sample, velocity-sensitive filter settings can be used to add some extra dynamics to the sounds. The rhythm unit also features six stereo outputs (in hosts such as Cubase SX), making it possible to process different elements of the kit independently. The synthesizer unit covers all the usual sound groups. On loading, only the topmost strip of controls is shown (in virtual 1U rack format) and basic editing can be performed from here without taking up too much screen real estate. However, the interface can be expanded to show either the selection of presets available or the edit screen, as shown here. Each of the four layers has access to an independent LFO, two oscillators (into which samples from the basic wave data can be loaded), filter, arpeggiator and three effects. The effects include high/low-pass filters, three-band EQ, distortion, overdrive, chorus, auto-wah, tremolo, various delays and reverb. Key and velocity ranges can also be specified for each layer. A Reason-like MIDI Learn function allows MIDI controllers to be assigned to individual parameters. Finally, three master effects can also be specified. While none of this is particularly cutting-edge in terms of modern synthesis methods, in use, it proved both effective and straightforward. As Mike Senior has described recently in his series on XG synthesis, by layering basic sounds together it is possible to build up something much more complex. Patches such as 'Deep Blue See', 'Fascination' and 'Drama' (all within the Slow Synth category) are really effective and demonstrate Ravity 's potential. This said, even the single-layer patches can be very good indeed ('Hysteria', with a little pitch-bend, is great for lead lines!). Ravity is supplied with 512 ready-to-use preset sounds and user patches can, of course, be saved. PSP Audioware's Nitro is a multi-mode filter plug-in with a feature set that suggests some serious processing possibilities. In essence, Nitro provides four Operator modules, each of which can be assigned one of 18 filter/effects types. The filters include three types of two-pole, double-sampled, state-variable filters with self-oscillation, bi-quad filters without self-oscillation, Moog-style filters, a comb filter and various phasers, stereo width/balance, saturation, lo-fi, panning and delay effects. A configuration screen, selected from the CFG tab in the virtual LCD at the centre of the display, provides very flexible routing through the four Operators, with gain adjustment at each stage; a number of useful routing presets are provided. In addition to the filters, the audio signal can be modulated through two LFOs, an envelope detector and an ADSR envelope. Nitro 's functions can be time-based or sync'ed to the tempo of the host application. Real-time MIDI control is also possible and Nitro features a Reason-like MIDI Learn function for assigning continuous controllers. From the LIB tab, Nitro also features a comprehensive Library system for loading/saving complete presets. These are stored in three banks of 64. I tested the PC VST version within Cubase SX (v2.2.0) on a 2.4GHz Pentium 4 test system and Nitro worked flawlessly throughout. I started exploring via the 192 factory presets and using a fairly bland Halion-based Minimoog sound as an audio source. The fixed portion of the user interface contains all the controls for instant editing and, in use, I found this very intuitive. As well as global controls for input, mix and output levels (plus a Power switch that acts as a bypass button), four sets of identical controls are provided for the respective Operators. These include two parameter knobs, and the red lettering beneath each knob indicates which parameter it controls — this varies depending upon the filter or effect type selected. Even stepping through a few of the presets and experimenting with these controls, it is obvious that Nitro is capable of making some impressive transformations to an otherwise uninspiring sound. Whether you want lo-fi grunge, fat techno bass or lead lines, classic (clichéd?) filter sweeps or sounds that add movement within the stereo field, Nitro can do it all and a lot more besides — both subtle and extreme (so watch those speaker cones!). The tabs within the central LCD provide access to more detailed editing possibilities and it is here that things can get a bit more complex. While it took a little time to get to grips with what can be achieved, PSP should be commended on the PDF manual — it provides a very accessible introduction to the plug-in and takes some of the learning-curve pain away. Of course, all this processing does come at a price and within SX on my test system, I found each instance of Nitro consumed about 6-7 percent of my CPU resources. Given the quality of the results, however, I think this is actually a pretty good result. Sony's Oxford Inflator is a loudness enhancing plug-in, and is available for the TC Powercore and Digidesign Pro Tools HD, Mix and LE platforms. This type of effect is commonly achieved through the used of compression and/or limiting, but Inflator uses a statistics-based algorithm to being up the level of quieter elements within a sound, and this is so radically different from the way a compressor or other dynamics processor works that it can even make full-scale white noise sound louder. Indeed, the manual claims that Inflator can increase the loudness of virtually any recorded material, even if it's already been compressed. Additionally, Inflator has some non-linear attributes that can be exploited to create the type of 'warmth' normally associated with analogue processors. I don't pretend to know exactly how Inflator pulls off these tricks, but the manual says 'The Inflator process functions by changing the relative probability of the samples in the programme such that there is a greater predominance and likelihood of larger values than the original signal. The full dynamic information of the music is largely preserved despite the increase in average modulation density.' It then goes on to say that as Inflator doesn't rely on signal compression, you don't get any of the pumping or transient degradation that you can get using compressors. It can, however, be deliberately overdriven in much the same way as a tube circuit, so it may be used to enhance the tonality of a sound as well as to make it sound louder. All this is done using just a couple of buttons and four sliders, two of which control levels and two of which adjust the way the process is applied. Inflator can treat signals that would otherwise exceed digital full scale by switching off the Clip 0dBr switch to open up what might best be described as a 6dB soft limit zone. The extent of this extra level is displayed on the 'above 0dB' upper part of the input level meter. When the Clip 0dBr switch is on, Inflator 's range conforms to the normal range of a digital signal with hard clipping at full scale (0dB). Powercore and Pro Tools TDM users get two versions of the plug-in: the first, direct-only version uses less DSP resources than the other, which offers a choice of direct or split-band operation. The split-band process works independently over three frequency bands, but can result in more obvious clipping at the output stage. Interestingly, though, Inflator has the ability to lessen the subjective effect of clipping, whether it's present in the input signal or due to hitting the end stops with the Clip 0dBr switch on. The first step is to feed in an input signal, with the level as high as is possible without clipping. An input gain control allows the input to be adjusted manually if it isn't normalised and a red 0dB peak indicator flashes when the signal hits its peak level. Setting the output level control to maximum ensures the input and output meters read the same maximum levels when audio is being processed, after which the Curve control can be adjusted by ear. By default, this is set to its mid position and the band-split selector switch is off. The Effect Level control adjusts the increase in perceived volume and the trick is to use as much as you can without compromising the tonality of the signal or adding unacceptable distortion. A further increase in loudness may then be achieved by switching off Clip 0dBr and using up some of the soft-clip headroom. The manual suggests the best results are usually achieved by setting the Effect Level to maximum and then adjusting the input level and Curve controls for the best subjective results. The Curve control affects both the perceived loudness and tonal nature of the signal. At its minimum setting, the amount of loudness enhancement is quite small but tonal enhancement still takes place, mainly adding an impression of warmth. Used on mixes, louder elements will stand out more and the overall sound is tightened up, which is useful when trying to lift drums out of a mix. In analogue terms, this would be similar to expansion, but without the side-effects. As the Curve control is moved towards its middle position, overall loudness is enhanced and the dynamic balance between loud and quiet sounds isn't changed significantly. Warmth and harmonic detail is enhanced for that 'more of everything' sound and peaks are controlled without a loss of presence. The effect here isn't unlike using a tube processor, and it responds to high levels of drive in a similar way. At settings above halfway, the effects of added warmth and level are further increased, and in 'analogue money', this is more akin to the effect of compression combined with gentle analogue saturation. Bass parts lift out of the mix and everything sounds more 'up front'. To create deliberate and more obvious distortion, you can set the Effect Level to maximum, then increase the input level while adjusting the Curve control and trying both settings of the Clip 0dBr switch. TDM version (includes RTAS and Audiosuite versions) £290; RTAS/Audiosuite-only version £145; Powercore version £220. Prices include VAT. Audio Damage are a relatively new face in the competitive plug-in market, and Mayhem is their first commercial release. It actually consists of five VST plug-ins: Filterpod, stereo and mono Crush, Master Destrukto and TimeFnk. Filterpod is a based around a low-pass filter that contains an internal LFO and adjustable distortion stage. Looking suitably organic in a fetching grey colour, Filterpod is based around just six controls that adjust the cutoff frequency/width, resonance and mix of the filter, plus the depth and rate of the LFO and amount of distortion. 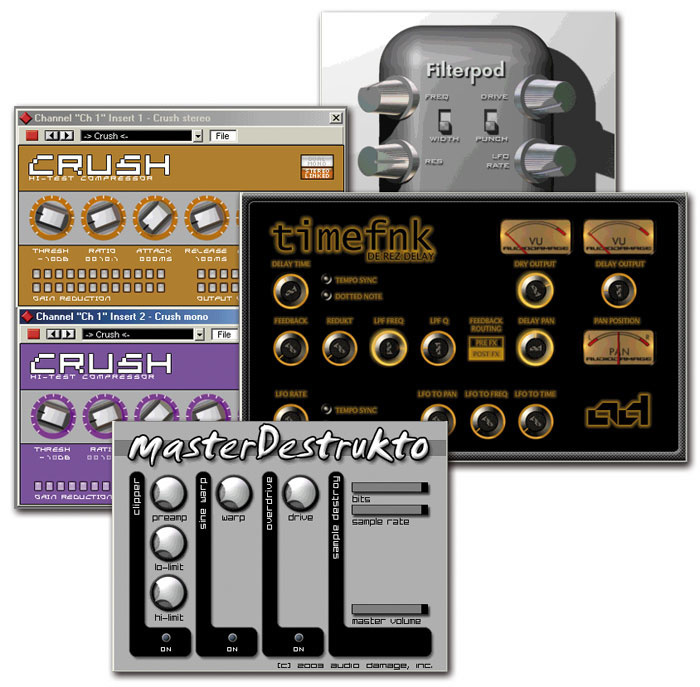 Simple to use, Filterpod adds plenty of bite to just about anything you put through it, and with the aggressive curve of the resonance and distortion turned up to full, you can get pretty brutal with any overly polite synth sounds. Crush is a pair of compressors, one for mono signals and one for stereo. Describing the results as 'unapologetically in your face', Audio Damage have decided not to hide any odd artifacts and compression side-effects but instead to 'embrace them'. Alongside the usual Threshold, Ratio, Attack, Release and Make-up (gain) controls is the aptly named Grunt, for adding even more fatness and warmth to the compression. Metering is done via two rows of orange lights, one pair for gain reduction, the other for output level. I'm not so keen on the deliberate 'low-tech' style of Crush 's interface, but once again it's easy on the eye and simple to get to grips with. Compression always comes down to personal taste and whilst Crush is hardly subtle, it does add a heavy and robust flavour to drum loops that I found really appealing. The next plug-in in the collection goes by the very B-movie-villain moniker of Master Destrukto. Perhaps not unexpectedly, this is a distortion unit, based around four different sections: Clipper, Sine Warp, Overdrive and Sample Destroy. Each section employs a different distortion algorithm, and they can be used independently or all together. The Overdrive section is based on a model of an (un-named) vintage guitar pedal, whilst Sample Destroy uses two controls to reduce the bit depth and sample rate of the incoming signal. Master Destrukto is a bit of a beast, which under tight control can go from adding just a touch of crispness — perfect for taking off those smooth digital edges — to full-blown audio destruction of whatever you feed it. The ability to mix and match the four distortion types makes for a powerful tool that is also great fun, but use with caution or all you'll be left with is a few clicks and glitches. Last but not least is TimeFnk, a rhythmic delay plug-in that features an adjustable resonant filter and yet more sample-rate reduction for that vintage flavour. An LFO is tempo-sync'ed to the filter, and can be used to control both the cutoff frequency and panning, which leads to some interesting effects. In keeping with its vintage aspirations, TimeFnk uses three attractive VU meters for displaying the dry/delayed signal and pan position, and also packs plenty of character, whether doubling up a sound for extra fatness or descending into filter-sync'ed chaos. Taken as a whole, Mayhem offers a nice array of plug-ins dedicated to messing up your nice clean sounds in a truly creative fashion. All the user interfaces are clear and easy to understand, and the sound quality is excellent. Packed with attitude, the majority of effects are far from subtle, but for some heavyweight audio destruction or sound-shaping that is powerful, yet has bags of 'turn it and see' usability, Mayhem is just the job.